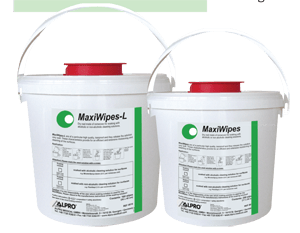 Large dry wipes in the MaxiWipes-Box for the cleaning and disinfection of surfaces of medical devices in combination with MinutenSpray-classic, PlastiSept and IC-100. Remove the lid of the MaxiWipes Box. (To refill put the reel into the box). Soak the dry reel with the requested disinfection solution (1.5 Ltr. PlastiSept, 2.5 Ltr. MinutenSpray-classic, 1.5 IC-100 per box of MaxiWipes). Pull the first wipe through the tear-off slot of the lid, close the box and allow the wipes to get soaked for 30 minuts. Then the wipes are soaked sufficiently and ready for use. Download detailed product information and safety data sheets.